Merry Christmas and Christmas day is coming to an end in about 55 minutes. Here is a Christmas Day piece - a wire wrapped butterfly pendant with a heart shaped amethyst focal and Swarovski crystals surrounding it. I love that. 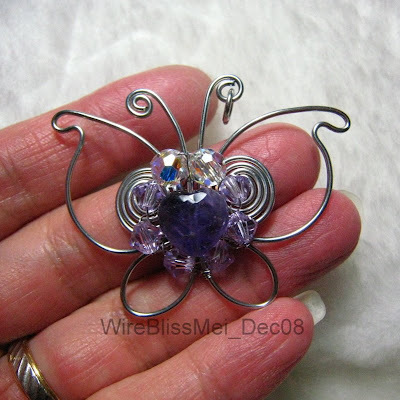 The more I see the more I think I should learn wire wrap, yet the one time I had a lesson, it did not thrill me. Might have to try again. Very nice, Mei. And it's created in such symmetrical way!